Xigera (pronounced Keejera) is one of the Okavango Delta's (and Botswana's) best kept secrets. Built in one of the most beautiful corners of the Okavango, Xigera Camp is situated on "Paradise Island" within the Moremi Game Reserve. Nestled in a magnificent riverine forest, Xigera epitomises the Okavango Delta: a tranquil true Delta experience in the domain of the elusive sitatunga antelope and sought-after Pel's Fishing-Owl. Xigera is set in what is truly a wetland paradise, surrounded as it is by deep channels and lush riverine vegetation. Xigera feels like a place apart, a blue-green bubble in which birds sing and baboons bark, people laugh and glide by on mokoro and each tent looks out over water that lies dreaming, undisturbed by the riotous world as it moves on noisily somewhere else, in another time and place. The camp consists of ten luxuriously furnished tented rooms each with en-suite facilities and an outdoor shower. Raised on wooden platforms and walkways, each tent offers superb views of the seasonal floodplain and lagoon and a feel of living in the midst of a riverine forest. Meals and evening drinks are enjoyed in the lounge, pub and dining area overlooking a permanently flowing channel or under the stars in a traditional African boma. For those hot days there is a small plunge pool in which to cool off. Guests are sometimes treated to close-up views of lion or leopard using the footbridge connecting Xigera's island to the next! The camp "newspaper" (a sand pit built into the bridge to capture paw prints) is "read" each morning and provides information on unseen nightly visitors to camp. Permanent water year-round allows an unparalleled variety of activities such as mokoro trips, game drives and motorboat outings; being the only camp in the area ensures total privacy. A mokoro ride is mandatory at this camp. On this traditional dug-out canoe, the only sounds are the rustling of the wind through the reeds, the lapping of the water against the boat, and the call of the African Fish-Eagle. The blue of the sky is mirrored in the water, broken only by large round water lily leaves and their stunning purple and white flowers. There is no better way to experience the Okavango than to travel through it by mokoro and to walk and camp out on its remote islands. Xigera is set in the heart of the Okavango Delta and the new mokoro trail starts soon after you land at the airstrip and meet up with your local BaYei guides. After a short drive to the starting point and a safety talk, you climb into the mekoros and set off into the wilderness for a two-night adventure on mekoros. Mekoros are dugout canoes propelled by a guide/poler who uses a long pole to push the craft through the Delta's shallow, winding channels. Some of the mekoros carry the camping gear, drinks and food while others carry the guests and their personal luggage so that the group is totally self-contained and can operate and progress at its own pace. You will stop for a picnic lunch on the first day and find an island on which to make camp by mid-afternoon. The poler's will set up camp (although the guests are welcome to join in if they so choose). All meals are cooked on the campfire and there are bucket showers and a "long drop" loo. The tents are specially designed with the top made of netting so one does not lose the feeling of sleeping out under the stars. The tents do provide a safe and secure night with comfortable bedrolls including duvets and pillows. After an early breakfast and a short walk while the poler's break camp and load the mekoros, you will set off for another island - enjoying the sights and sounds of the Delta and it's wildlife whilst relaxing in the dugouts. Most of the older guides at Wilderness Safaris cut their teeth taking similar mokoro trips and they love them for this reason. It's the ultimate feeling of freedom in this exquisite wilderness - unrestricted by any outside influences. The group is always accompanied by a senior guide and the trips run from mid May to the end of October to fit in with the rise of the annual flood. Stops along the way during the day to walk and explore for any reason are the norm. The rhythm and pace depend on what is happening at that moment. On your last morning, you pack up your personal luggage and head back to the airstrip for the flight out to the next camp to continue your adventure. The Xigera Mokoro Trail can be booked as a standalone safari based upon camp and guide availability. Minimum 4 guests only. Xigera has outstanding birding. Pel's Fishing Owl, Wattled Crane, African Skimmers, Slaty Egret, Rufousbellied Heron, Swamp Boubou and a host of eagles, vultures and raptors will keep the bird lover fully occupied. The rare Sitatunga antelope are at their highest density in the Okavango in the Xigera area. Stalking Sitatunga silently by mokoro is an experience never to be forgotten. The wooden foot bridge, which connects this island to the next, is often used by Lion and Leopard to move between islands. Many a guest has enjoyed Lion viewing from the dining room. When water levels permit, game drives are an attraction. Situated in the Moremi Game Reserve, but on the extreme western boundary, the Xigera concession is probably at the very centre of the Okavango alluvial fan. This magnificent area epitomises the permanently flooded section of the Okavango. Palm-filled hardwood islands, hardwood riverine forests and a multitude of clear water channels and flood plains are what the Delta wetland is all about. Although it is considered to be a permanent water camp, one may be surprised by the presence of lion, leopard, hyaena and buffalo on the islands. These animals will happily wade and swim between islands in search of food. This is the land of the sitatunga antelope and Pel's Fishing-Owl. Water birds are also seen in large numbers including Rufous-bellied Heron and the secretive White-backed Night-Heron. 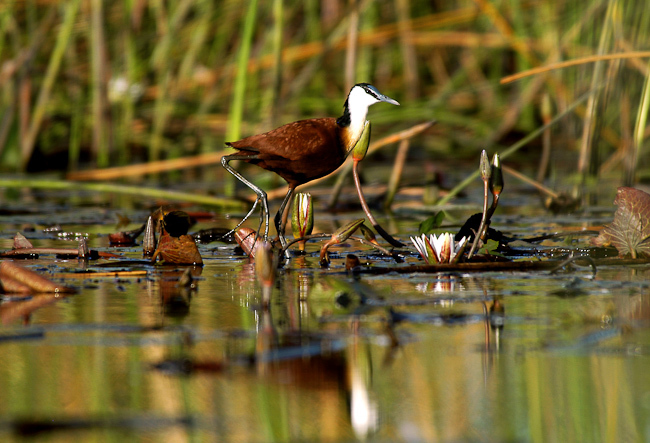 Papyrus swamp specialists include Greater Swamp-Warbler, Coppery-tailed Coucal and Luapula Cisticola. Birding around camp and on other islands is also extremely productive for specials like Brown Firefinch, Swamp Boubou, Hartlaub's Babbler and Western Banded Snake-Eagle. A displaying African Goshawk can often be seen in the morning. One of the great secrets of the Xigera operation is the presence of Okavango born tribesmen as guides. Some of these men were born a stones throw from the present location of the camp and know every turn and tree in this magical wetland. Xigera Camp donates a portion of each bed-night charge to the Motswe Wa Tsholofelo Orphan Day-care centre in Maun which provides education and food to orphans living with extended family members. Xigera also supports the Bana Ba Metsi School in Shakawe which takes in problem or delinquent school drop-outs and encourages them to go back to school and get an education and thus a better chance in life. Added to this, Xigera also donates time (certain camp staff) and money to the Maun Council Centre, which is an AIDS counselling centre.